The following were the TNSAR trainings for the 2015 - 2016 season. Join Russ for a journey to the mysterious headwaters of the mythical North Fork of the American River. Training will emphasize navigation and route finding. 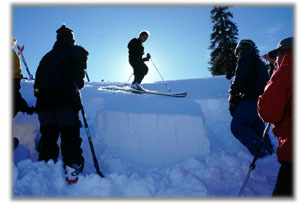 This seminar is modeled after the International Snow Science Workshop and other regional one-day snow and avalanche workshops throughout the west. It will feature a variety of speakers in the morning, then break for lunch (on your own) and return for additional speakers in the afternoon. Please register (http://register.asapconnected.com) ahead of time as it sold out last year. Join Randall for a morning session of map and compass work. He will be covering all the basics of navigation with hands on techniques and practice. If you have a compass and maps of the North Tahoe/Kings Beach area, please bring. Join Logan and Geoff from 6-8pm for a Team Garage Training. Learn the ins and outs of the Garage and the Team Truck, where important gear belongs and how to access it. Be there. Each year the TNSAR team puts on a Winter Wilderness Survival Program for 4th Graders in the Lake Tahoe area, intended to educate the students on the correct actions to take should they ever find themselves lost in the outdoors. New members and veterans alike are invited to attend. Share technique and knowledge from past experiences or get up to speed for your first season with the Winter Education Program. New Member Essentials. I’m a member, I have my OES card, now what? -For: TNSAR members or aspiring members seeking to get more involved in SAR. This training will give new members and members with limited search experience valuable insight to the dynamics of TNSAR. You can count on hands on experience and the knowledge to help you prepare for your first or next SAR. Still figuring out your first "smart" phone and overwhelmed by all that navigation tech you're carrying around? Let team guru Matt Jacobs straighten things out for you. Drop in at any time for help with maps/grids/datums, CalTopo and other mapping tools, moving data on and off your GPS as well as the team inReach units that we've started to deploy on searches. There will be some exercises to work on, or just stop by to get your questions answered. 6-10pm. Still figuring out your airbag pack that you purchased as part of the team procurement last year? Come on down for a comprehensive evening covering the use and protocols associated with a critical piece of search gear. Also a chance to deploy your airbag, repack it and refill the canister. The Winter Sports Symposium-Get the latest treatment modalities and strategies to manage winter injuries. The Team supports all A Team, B Team and Team Members with funding to attend. You must register yourself and refund will be given out at night of event. We will check out the Sugar Bowl ski resort and get familiar with the terrain. We will be using the lifts to get in a lot of skiing and heading out of bounds throughout the day. Scott Meyer will be leading a contingent of snowmobilers up Coldstream to rendezvous with the skiers. Contact Jeb or Scott respectively ahead of time to get details and make sure you get a lift pass. Backcountry gear needed for the day. Come join Scott for a day adventure into Coldstream Canyon. We will be doing terrain familiarization and team specific skills. Will also be rendezvousing with the ski team coming from Sugar Bowl for a joint team training. Scott will have more details at the team meeting. Join Sara for a solid day in a popular backcountry area that sees a lot of use. The plan is to ski into Deep Creek. Navigation, avalanche skills and touring efficiency will be on the menu for what is sure to be a fantastic day! Join longtime TNSAR hardman, Dirk Schoonmaker, for an outing under actual search conditions in the cold and darkness. All A and B team skiers are welcome. Bring skis and search packs, and definitely don't forget your headlamp. Join Joe for an all day adventure working on safe travel, navigation and beacon skills in the area west of the Sierra Crest in the vicinity of Grouse Rock and Twin Peaks down into the Bear Pen and Grouse Creek drainages. Particularly relevant to our 12/20/2015 search. Ray will lead us through snowcat basics from 6-9pm at the garage. Loading/Unloading from the hauler as wells as general familiarization with the cat and the steps required to get involved as an operator. Watch this space as this training should be rescheduled. Paul will be leading a training focusing on several avalanche scenarios and the use of your transceivers in real world burial situations. Always good to brush up on skills that don't get practiced enough. Realistically this is a continuation of the Sugar Bowl search, disguised as a training for anyone wanting to attend. Doug will lead from the Lincoln chair down to the Cedars, where you will be hauled out by the Snowcat or snowmobiles. LEAVING the garage at 7:00 or Judah at 8:00. RSVP to Doug (583-6381 or 414-0822). CANCELLED. Doug Read will be leading a mock search training at the Bradley Hut on Saturday 1/23-be at hut by 9am. A group will be heading out Friday afternoon at 2pm and will be sleeping in the hut. Come out for a fun filled overnight. With ~4 days of nice weather this week, we are planning another "round of looking" out-of-bounds at the Judah chair on Thursday before the poor weather comes in Friday. PLEASE RSVP (412-4419). This coincides with the Placer County debrief Thursday afternoon @ 4:30, so we would be out by 3PM (at the latest). Note new times. Ray will lead us through snowcat basics from 6-9pm at the garage. Loading/Unloading from the hauler as wells as general familiarization with the cat and the steps required to get involved as an operator. Join Paul for a day experimenting with the team's portable repeater in a historically challenging zone with regards to communication with the command center. Come join team member and Dr. Eric Stendell for a talk on avalanche resuscitation, post avalanche care, and end points in resuscitation. Event will be at the Squaw Valley Community room on 2/10 from 7-9pm. Snowmobile training with Squaw Valley's own Peter York. Come familiarize yourself with Squaw Valley as it pertains to snowmobiles and searches. Will be reviewing access routes & safety concerns. Leaving Red Dog complex between Far East lift and vehicle shop at 4:00pm. Try to keep up with Team VP Paul Honeywell on an all day ski up and over Rubicon and to the peaks beyond. Navigation, avalanche skills and touring efficiency among other skills will honed on this training. Come out and help get the course in shape. Due to the recent dry spell, we've got our work cut out for us and every hand helps. Come in by skis or walking. We will need to get in as far as 4-5 kilometers to get to the farthest places and there will be plenty of work within 2-3 kilometers. We will be working all day, bring lunch and water and stay as long as you can. This is the team's primary fundraiser, so if you don't have a job yet, call Chris to find one. We expect all hands on deck for what is sure to be yet another Great Ski Race. Join Matt to go over the gear on the team truck, with a focus on things new members need to know, such as what to grab on a training or search, radio and GPS familiarization, and understanding the repeater network. Training for all Search Coordinators to review proper protocol and procedure when coordinating a search. Join Pro Patroller team member Devin for exercises pertaining to the use of the Recco receiver, transceiver searching and organized probe lines. Each of these has been used at some point during live searches this season, so come on out and brush up or refine your skills. Join Northstar Patrol on a boundary tour to familiarize yourself with both the resort and the common areas that people get lost from. Space is limited to 12, please call to reserve your spot and to give an accurate count for lift tickets. The Team will be hosting a private Wilderness First Aid Course the weekend of 4/9-4/10, 8am-4pm. Sign ups will be first come first serve with priority given to A team/B team and then team members. A fully refundable deposit will be needed to hold your spot in the course. The Team will be hosting a private Wilderness First Aid Course the weekend of 4/22-4/24, 8am-4pm. Sign ups will be first come first serve with priority given to A team/B team and then team members. A fully refundable deposit will be needed to hold your spot in the course. Join Dirk for an effort to clean up the garage and get everything put away for the summer.